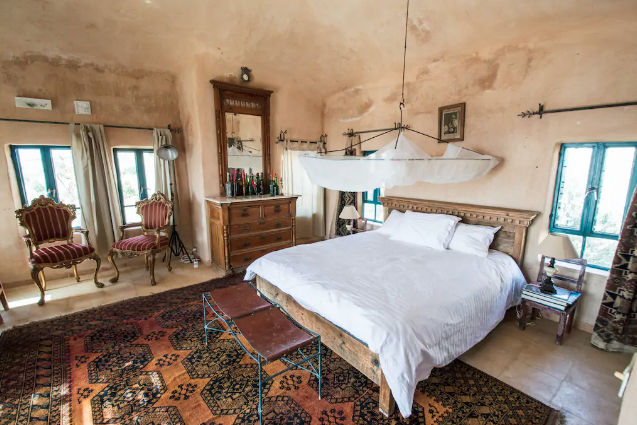 From a renovated 18th century Arab palace to a blue house in a blue city; a sailboat on the Red Sea to a cave dwelling in the mountains; here are 21 unique, authentic, decadent, and just all around amazing Airbnb stays from across the MENA region. 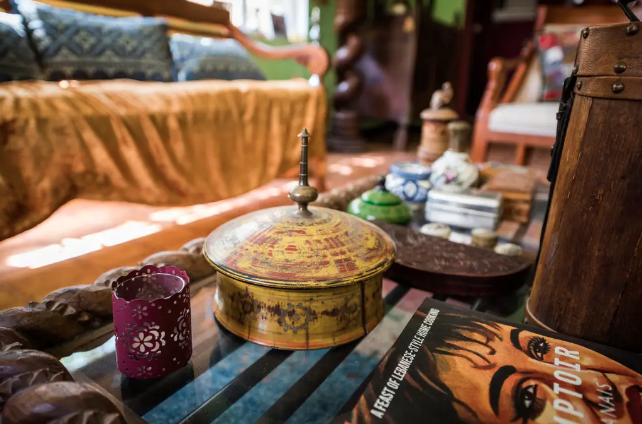 Since Airbnb’s launch in 2008, the company – the ultimate poster child of the sharing economy alongside powerhouse peers like Uber – has veritably exploded. Current estimates suggest it boasts over 150 million users worldwide – just five years ago in 2014, that number was 35 million. With 4 million listings worldwide, the San Francisco based startup’s total number of listings is actually higher than the top five major hotel brands combined, according to Business Insider, a testament to its disruptive nature, shaking up a decades old industry in just over ten years. 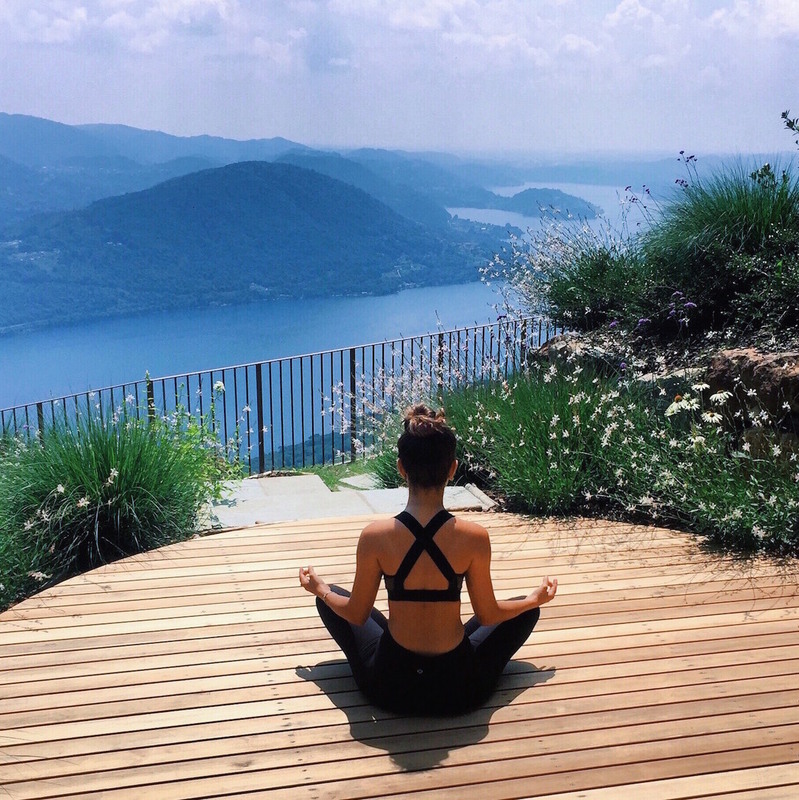 Fuelled by the ease and ability for travelers to rent not only affordable accommodation but also find unique and more authentic places to stay that are a far cry from the mass experience of resort hotels, the home rental platform has become a phenomenon. 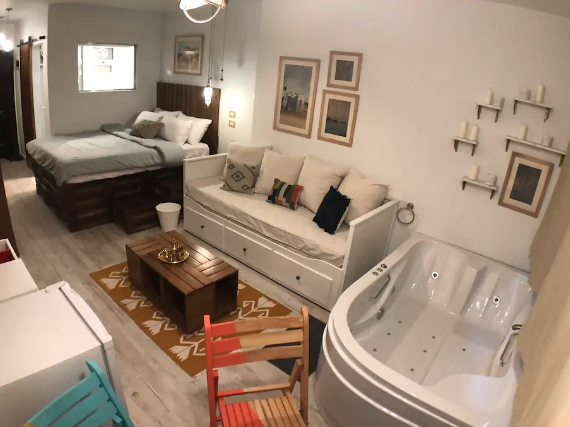 People are seeking alternative lodging with a vengeance, whether that’s a quirky little artist’s studio, a room in a farmhouse, or a sprawling 6-suite beach-side estate. The US remains Airbnb’s biggest market, followed by France, Italy, Spain, and the UK. 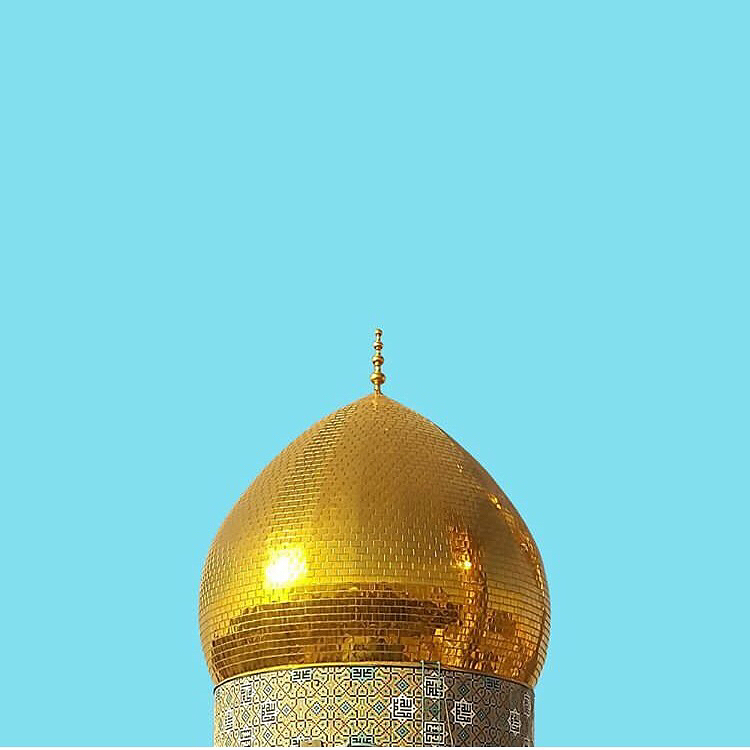 But what about the Middle East? 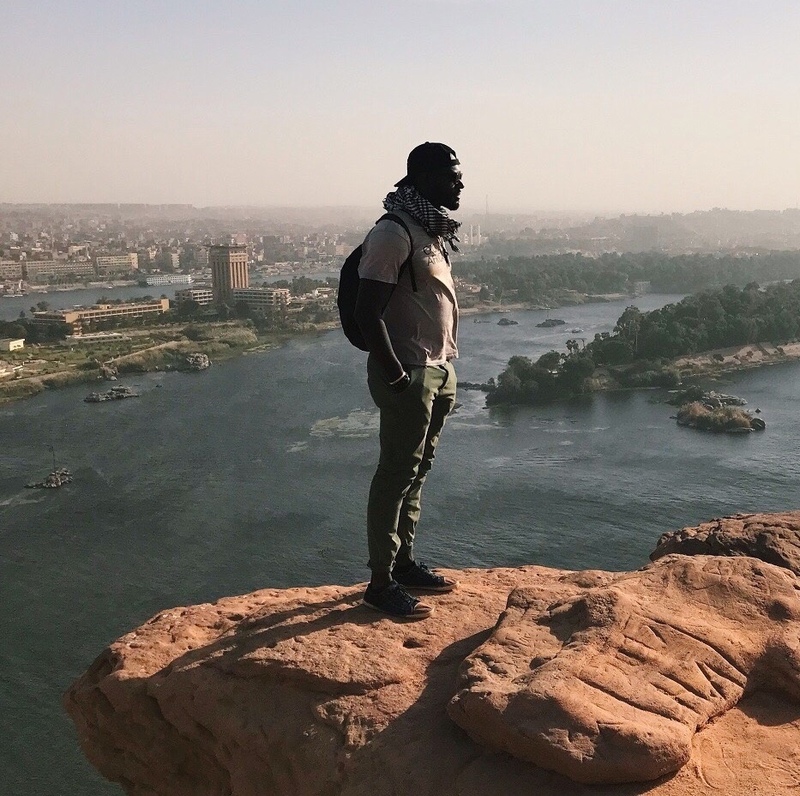 The MENA region may not have cracked the top 5 yet and while there are fewer options scattered across the Arab world than, say the US, there are still a flurry of incredible spaces to discover. 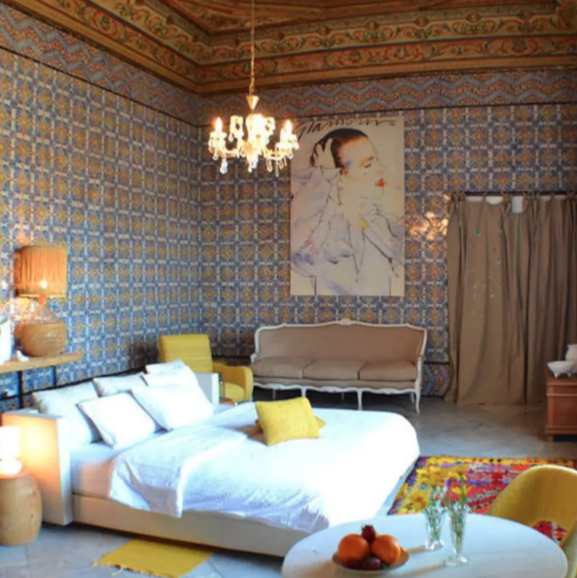 From a renovated 18th century Arab palace to a blue house in a blue city; a sailboat on the Red Sea to a cave dwelling in the mountains; here are 21 unique, authentic, decadent, and just all around amazing Airbnb stays from across the MENA region. *The values listed are indicated as minimum for each accommodation, but they may vary according to the date. 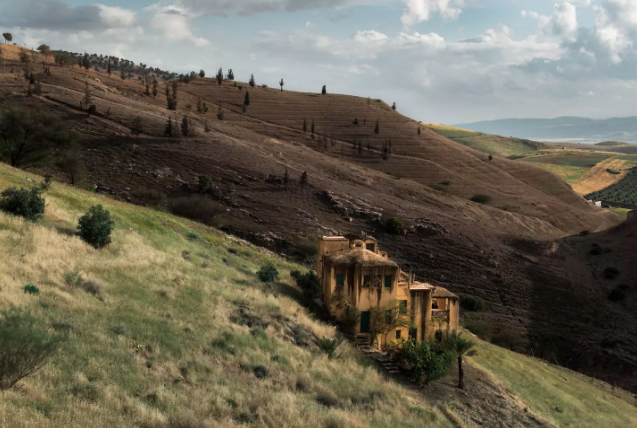 This artistic space, nestled in the rolling hills of the Jordan Valley in the country’s Irbid governorate – literally perched mid-slope – is a study in eclectic charm. 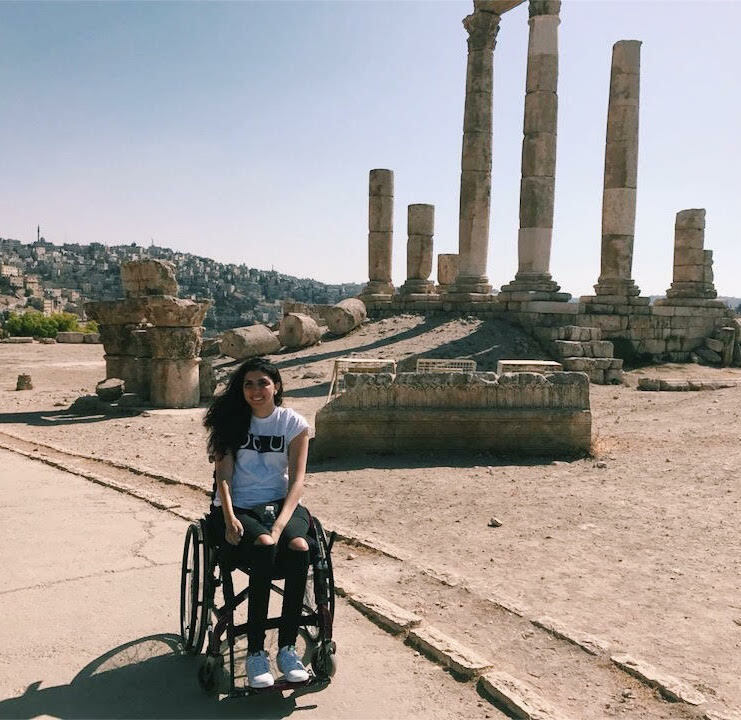 It was built in 1994 by renowned Jordanian artist and architect, Ammar Khamash, as a getaway where he could create, and now artists from around the world can do the same at this spot, just a couple hours’ drive from Amman. Full of quirky artsy elements, from its vantage point the house also overlooks Pella’s Ruins, one of the ten cities of the fabled Roman Decapolis. More here. 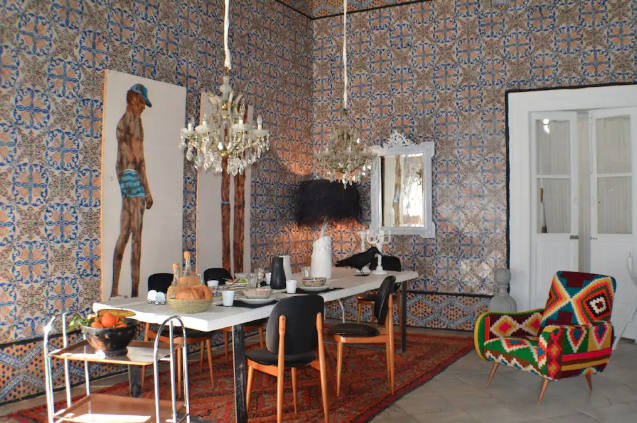 Dreamy is an understatement when it comes to describing this Airbnb. 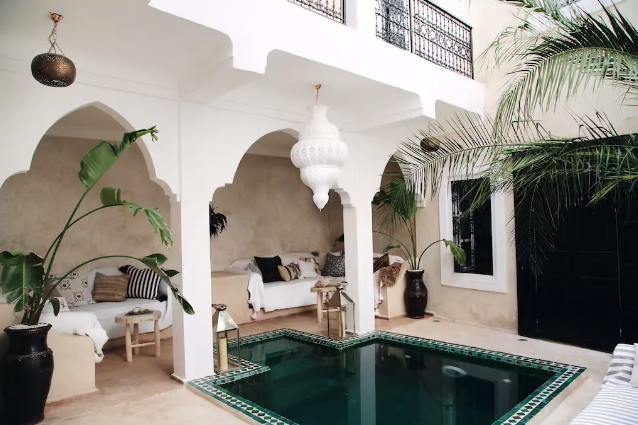 Built in traditional Moroccan style, with an interior courtyard featuring an emerald green pool, it also has four stunning bedrooms, a sunny terrace with daybeds, and a charming boho lounge on the rooftop. It’s located close to the Medina, an easy walk to all the souks and a 15 minute walk to the world-famous Jemaa El Fnaa Square. It also comes complete with a full time housekeeper, who can cook for the home’s guests! More here. You’ve probably seen Chefchaoun on Instagram more times than you can count. 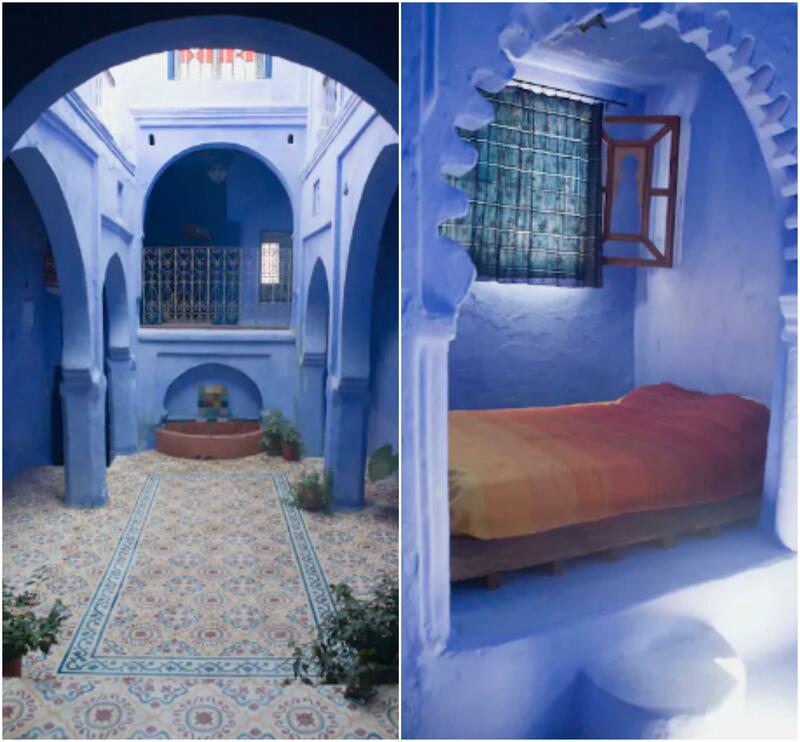 The city, often simply referred to as the Blue City, in the Rif mountains of northwest Morocco, is famous for the blue-washed buildings of its old town. This Airbnb is one such building. Set right in the heart of the otherworldly blue town, like many of the houses there, it is stacked on numerous levels (5 in total). It also has a spacey courtyard, an indoor fireplace, and a view that will quite literally take your breath away from atop the rooftop terrace. More here. 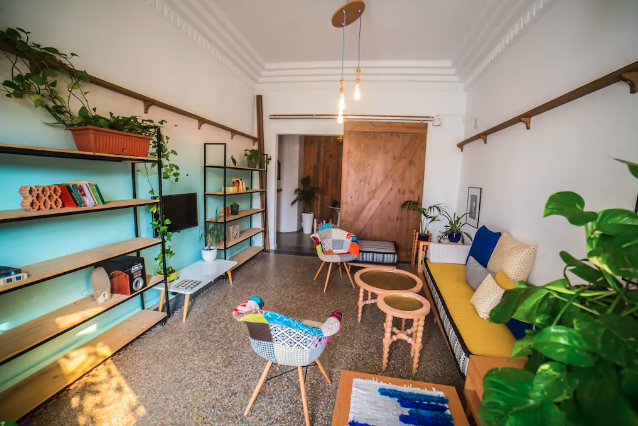 This vibrant flat is located in central Casablanca, and its owner, Soukeina, has been rated as a Superhost by Airbnb. With pops of colour everywhere, it features both an internal courtyard and a balcony, and while the bedrooms are simple but clean, it’s the common areas that are a real highlight at this sunny place. More here. 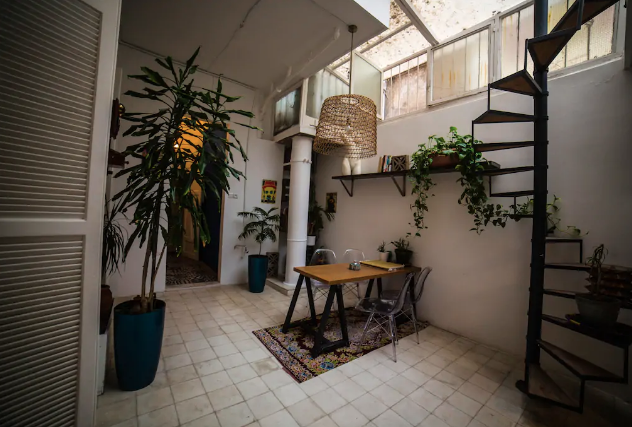 If you’re heading to Beirut, odds are you want to be right in the middle of all the action in this lively city, and this apartment is perfectly, centrally located in the bustling Mar Mikhael area, which is filled with myriad bars, restaurants, and cafes. 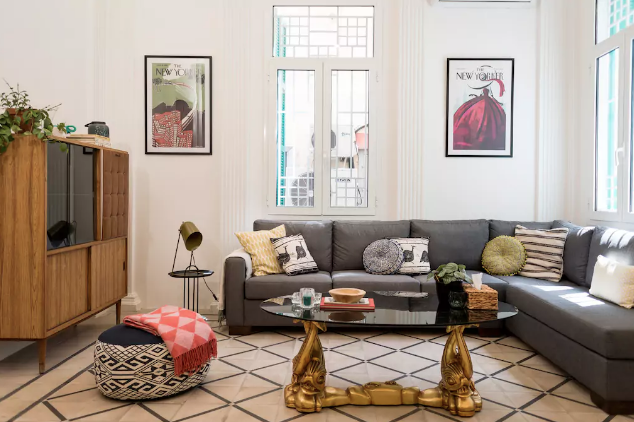 Aside from that, the spacey four bedroom flat itself – taken care of by Superhost Nathalie – is just as vibrant as the city it’s in. It’s got a sense of eclectic elegance while still feeling cosy; lemon yellow dining table chairs, neon signs on the walls, brass accents, and a blue velvet couch made this space a fun spot. Guests also have shared access to the rooftop terrace. More here. 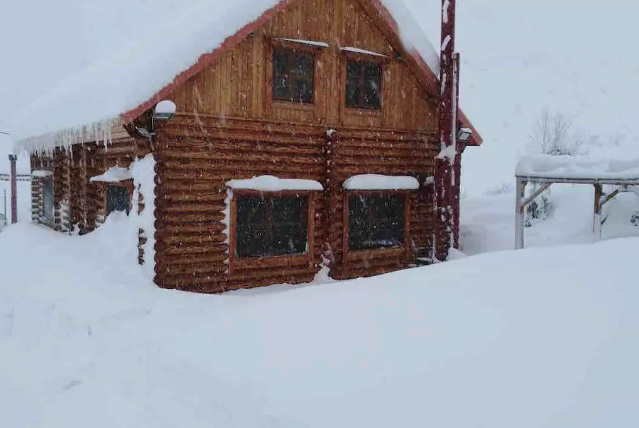 If you’re a skier, or you just want some cosy secluded winter vibes in snow-capped mountains, this Swiss-style wooden cabin is your spot. 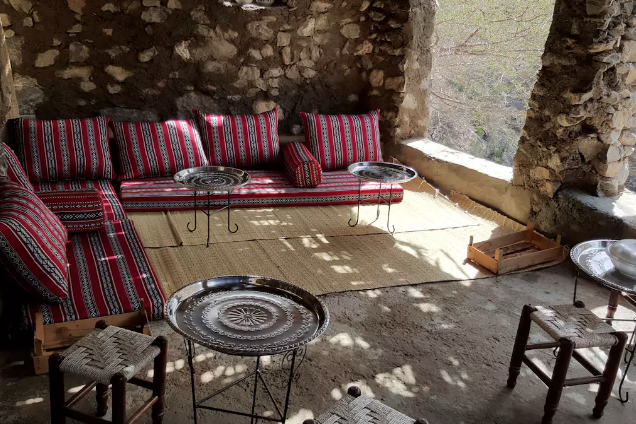 Located in Laqlouq, a small village in the Mount Lebanon Governorate, it’s got a charming rustic feel and stunning views of the surrounding mountains. 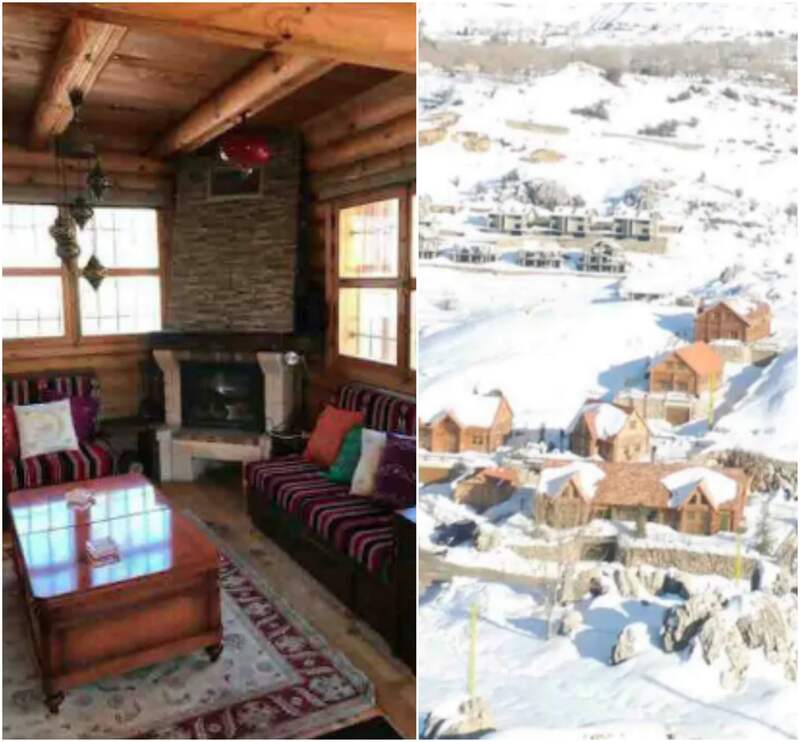 It sleeps eight, and is right next to the Laqlouq Ski Slopes, and the town is less than ten minutes away. More here. 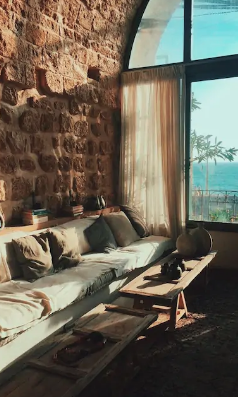 Set right on the beach of the coastal Lebanese city of Batroun, this charming bohemian home is the perfect reprieve from the stresses of big city life. 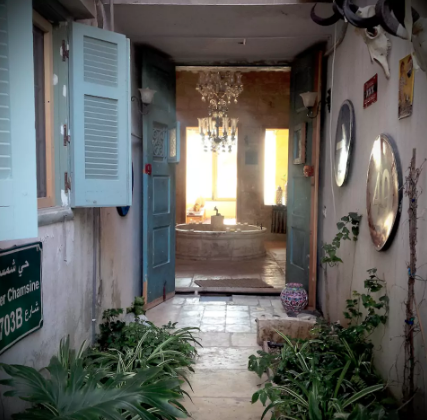 The cosy dwelling is a mish-mash of funky, vintage, and authentic elements; the living room windows look out onto the sea (which the space boasts is only 20 meters away) it has 2 bedrooms, and a private garden and features an adorable fountain in the center of the main hall. Aside from being a beachy town, Batroun is also home to an ancient Phoenician sea wall as well as a wine trail that passes by a number of northern Lebanese wineries. In fact one them, Seigniorial House, located in the hills of Batroun, won the CNN Green award for its completely sustainable facility. More here. 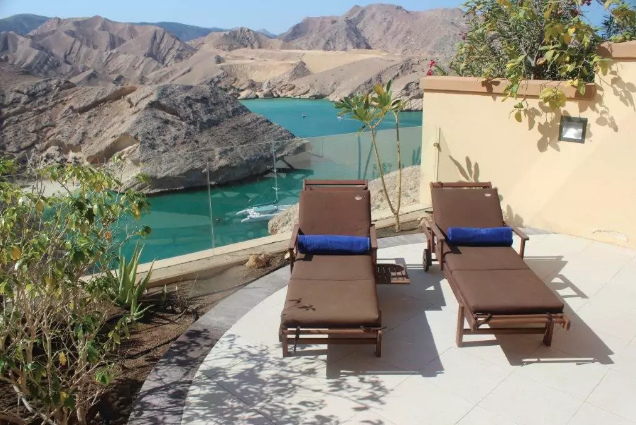 If you’re visiting the capital but you want a bigger space and stunning views, this modern villa has views to kill over the Arabian sea and mountains, and is a short 15 minute drive from central Muscat and the souk so you aren’t too far from the downtown area. The villa is well equipped, clean, and spacious, with a simple streamlined aesthetic, but it’s the stunning location on the edge of a cliff overlooking some phenomenal views that is the real prize here. It features a private garden and a shared pool. More here. 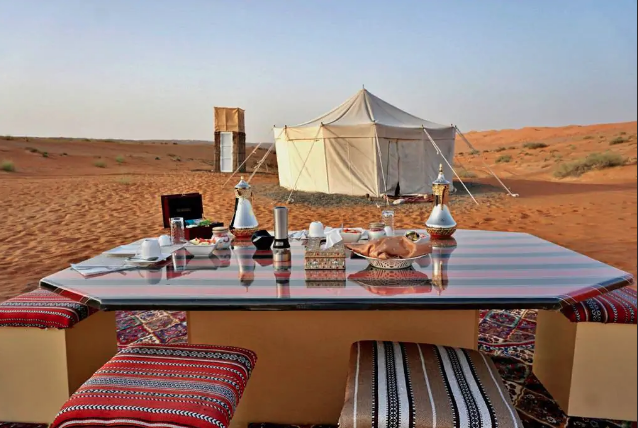 In the middle of the Wahiba Sands region of desert in Oman lies this intimate, far flung campsite. 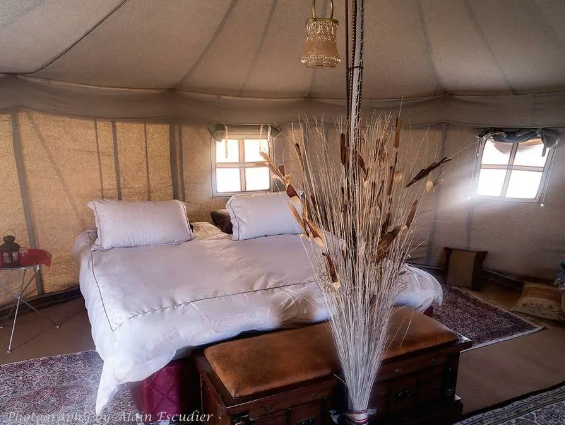 Blending authenticity with modern comforts, this is Arabian glamping at its finest. There are a total of 2 sleeping tents; you have the option of booking one or both. There’s also a little open air dining setup, a sprawling lounge tent, and a standalone bathroom. 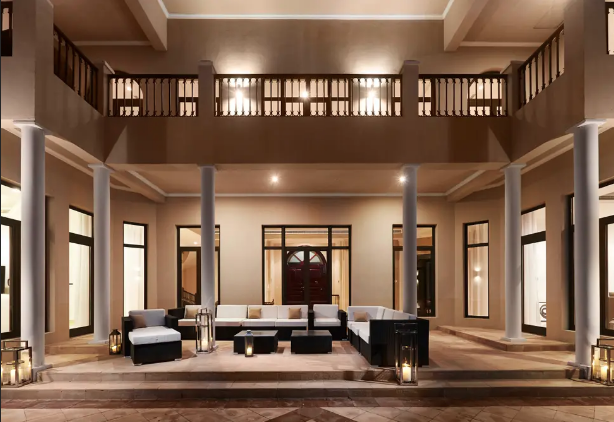 The experience comes with a private staff who cook for you, optional camel rides by day, and by night you gaze and the kaleidoscope of starry galaxies above. More here. 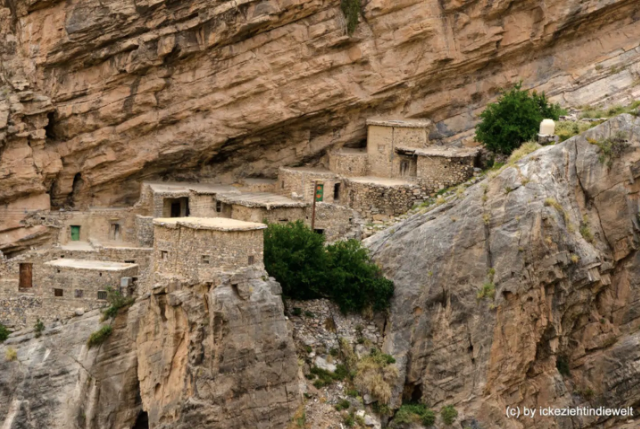 Oman’s Jebel Akhdar region is raw, rugged mountain terrain, and built right into the walls of the cliffs here is this incredible traditional Omani guest house. A sustainable project, itt currently features a grand total of two rooms, so it fills up fast, and a stay there comes with breakfast and dinner and spectacular views across the valley. Remote is an understatement when it comes to this spot, as the nearest village is a 20 minute hike away. Hiking in general is a big attraction in this area. More here. 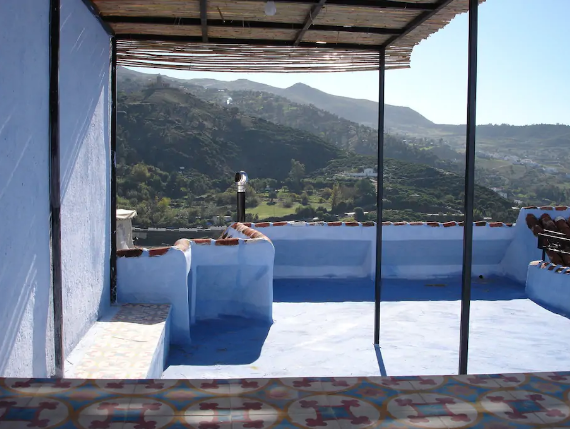 A pool on an outdoor terrace perched right above the sea is the highlight of this four-bedroom villa in Algeria’s Tipaza Province, a coastal, Berber-speaking area of the country. 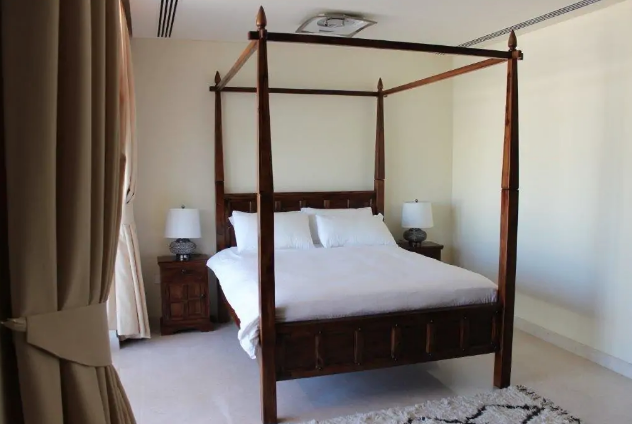 The bedrooms are simple with basic furniture – but guests have all maintained that the entire place is sparkling clean – and all come with beautiful scenic views of the surrounding sea and mountains. 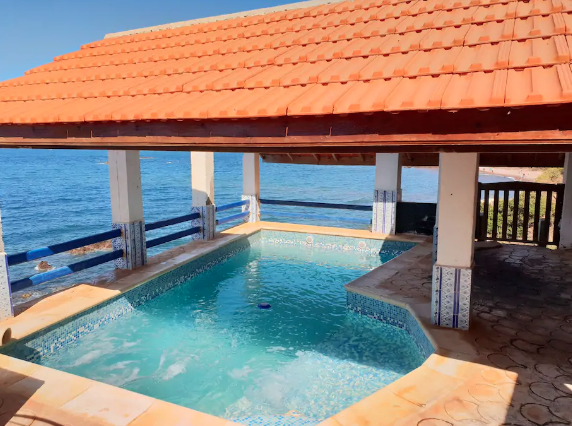 The home not only has direct access to the beach, where you can swim and snorkel, but is also well situated to reach the Roman ruins of Tipaza, a UNESCO world heritage site. More here. 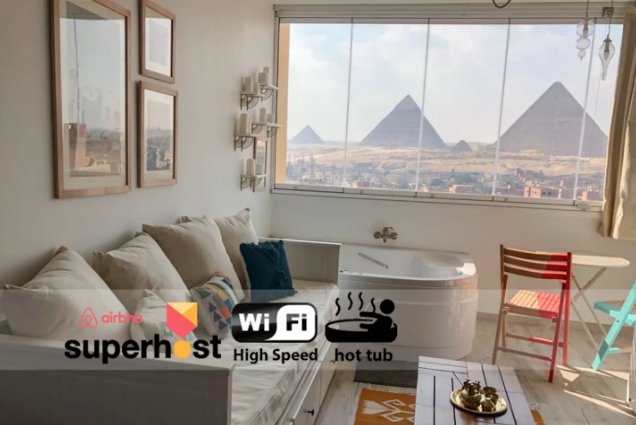 If you’ve ever dreamed of soaking in a bubble bath in a large tub right by a window with perfect direct views of the Pyramids of Giza, then there are few homes that can compete with this spot. The studio apartment is cosy and clean, and features a window-side bathtub separate from the shower in the bathroom. 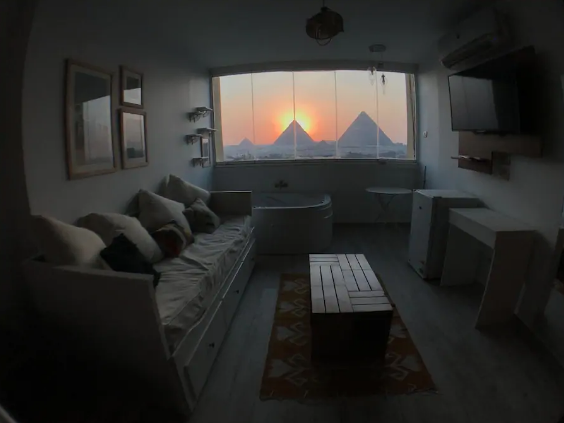 The view of the pyramids is quite literally unparalleled and the sofa doubles as a pullout couch if you want to fit a few more people. More here. The Red Sea is a nautical playground, and while there are many gorgeous resorts along its coastline in El Gouna and Hurghada, but experiencing it from a boat is a whole different experience. 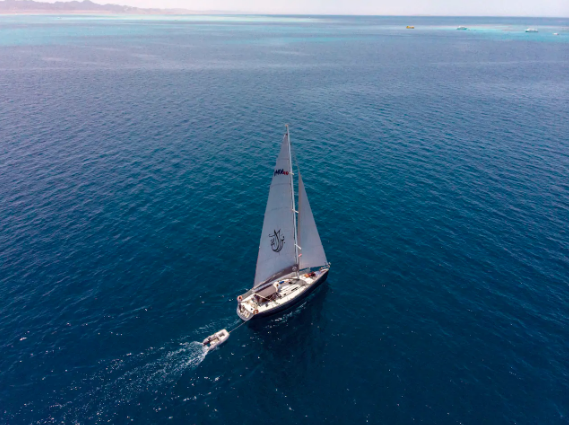 The boat is moored in the Abu Tig Marina, which is close to El Gouna’s nightlife, cafes, and restaurants, but Superhost Ahmed can organize day sailing trips for guests, or even an overnight trip to an island. The latter two require an extra fee but for $30 a night, the initial cost is already extremely low. Guests can request to sail to coral reefs in the area with amazing marine life, and if you kite surf and the conditions are right the host can organize a trip to an island where guests can kite all day. 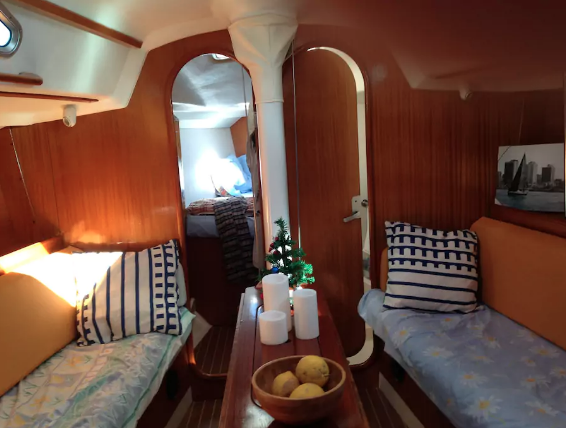 It is not a yacht so the sleeping spaces are small, but it’s most certainly a unique experience and being aboard a sailing boat allows you to move around the coastline with ease. More here. 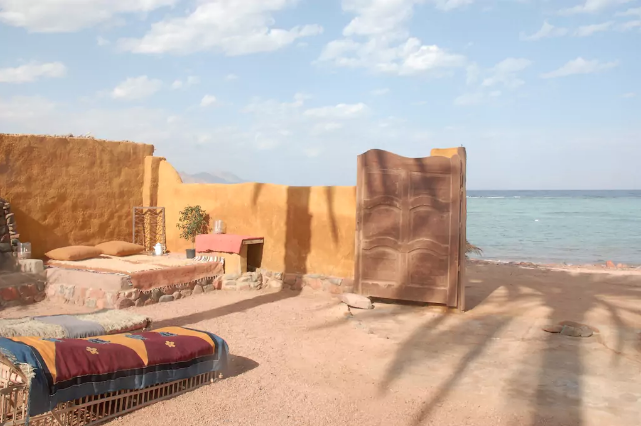 Dahab, a small town on the southeast coast of the Sinai Peninsula in Egypt, is one of the most laid back and mellow spots in the country and a diver’s paradise. Situated on Assalah Beach, Egypt’s crystal clear Red Sea is literally right outside your door and the Eel Garden the houses faces is a unique spot for swimming, diving, or snorkeling. 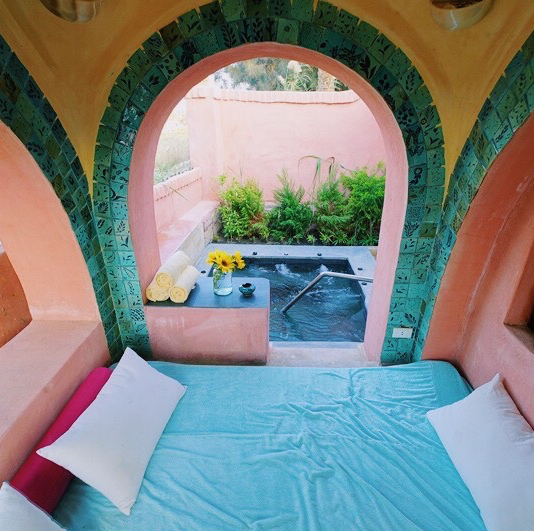 The house is a short walk from the souks, restaurants, and Dahab’s main promenade. Styled by designers and artists, the home features unique, locally sourced, up-cycled & re-cycled objects, reclaimed & driftwood furniture and Bedouin & Egyptian Art and superhost Fiona says that snorkelling, diving, windsurfing, kitesurfing, desert trips, boat trips, mountain dinners and airport transfers all easily arranged. Plus you can have fresh fish, available daily by order. More here. 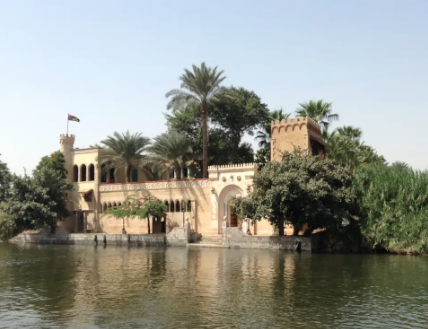 There are very few experiences that can compare with staying in a former palace located on a tiny island in the middle of the Nile in Cairo that you can only reach by boat. Many stunning Cairo hotels boast a Nile view, but none are literally in the center of the Nile. 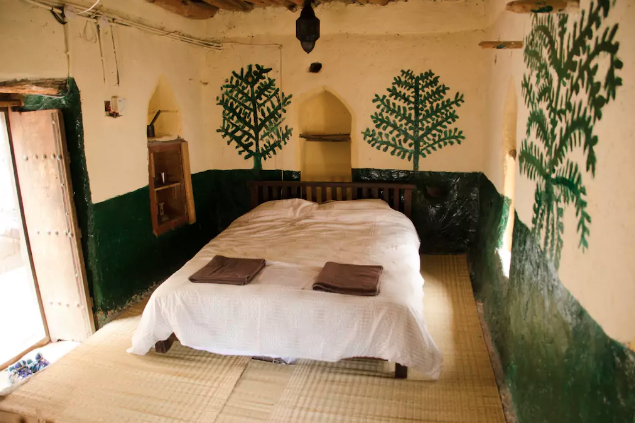 The island is car free so you can roam the old palatial gardens or stroll through traditional villages, and the stay comes with a private butler service for breakfast. More here. 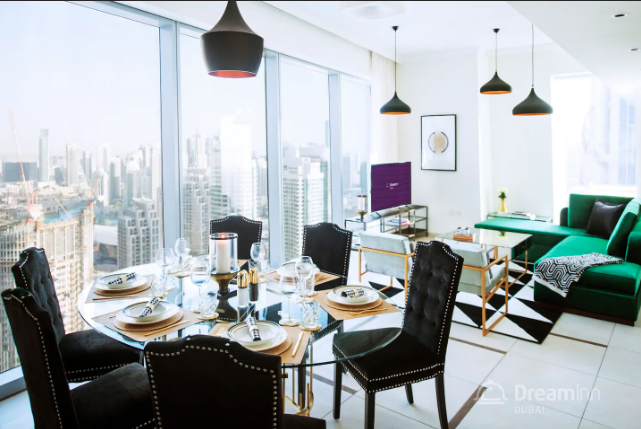 This swanky apartment looks like it was ripped out of the pages of Vogue Living; it seamlessly blends elegant and eclectic taste throughout, and there are floor to ceiling windows in almost every room, giving you panoramic views of the city below, including the iconic Burj Khalifa, and Dubai’s dancing fountain. 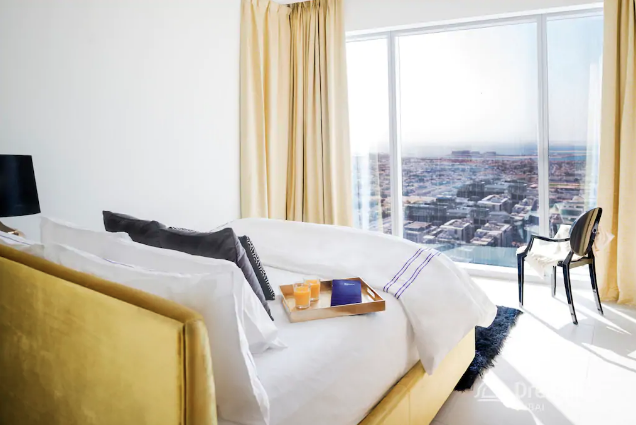 It has three chic bedrooms, and is located right opposite a Metro station and a 15 minute walk (via an air-conditioned covered walkway) to Dubai Mall and Burj Khalifa. More here. When in Dubai, if you want to experience the city, the two best places to stay are right Downtown (above) or JBR (Jumeirah Beach Residence), a waterfront strip and community. 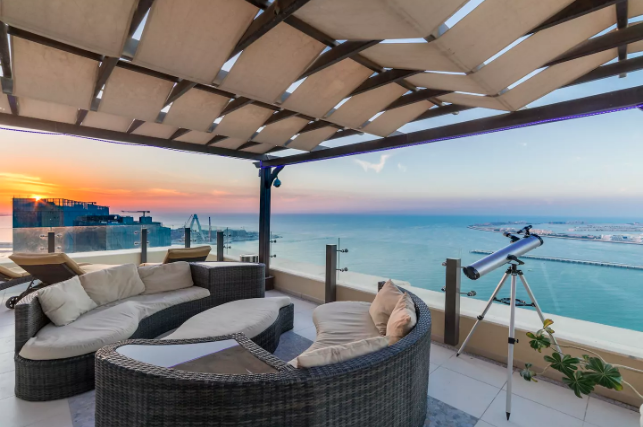 This penthouse apartment’s biggest highlight is its incredible sprawling terrace and its stunning views and comfortable lounging area – in fact, the hosts boast that tv shows have actually filmed the amazing Jumeirah palm fireworks from that very terrace. 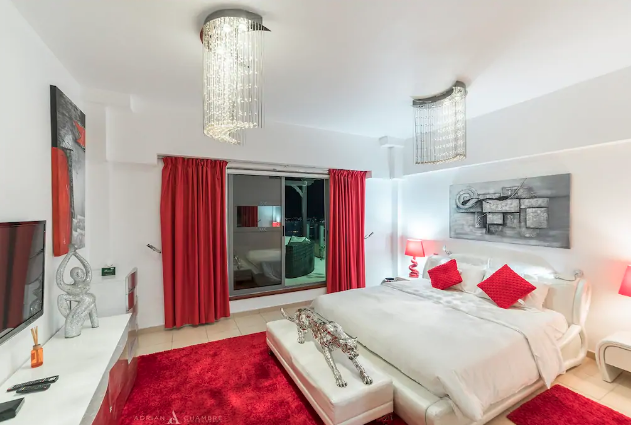 The interiors are rather futuristic with – think a bedroom with cherry-red everything and a silver jaguar on the furry carpet – and the home comes with 4 TVs, and access to the building’s pool and gym. More here. 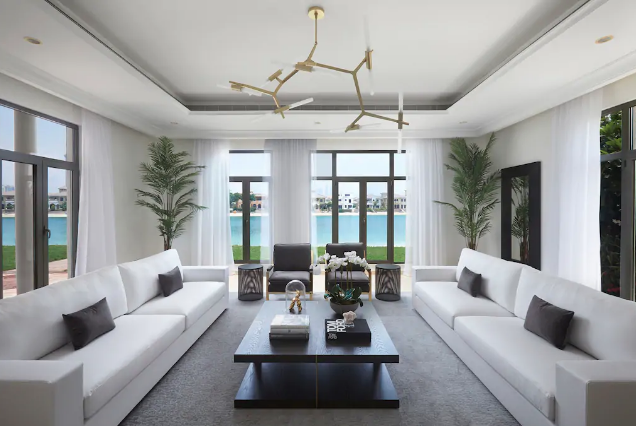 If there was ever a time to indulge in insane luxury, it’s probably when you’re in Dubai, and this enormous, elegant mansion on the city’s famous The Palm Jumeirah, the man-made palm-shaped island, is a force to be reckoned with and looks like it would be right at home in Architectural Digest. 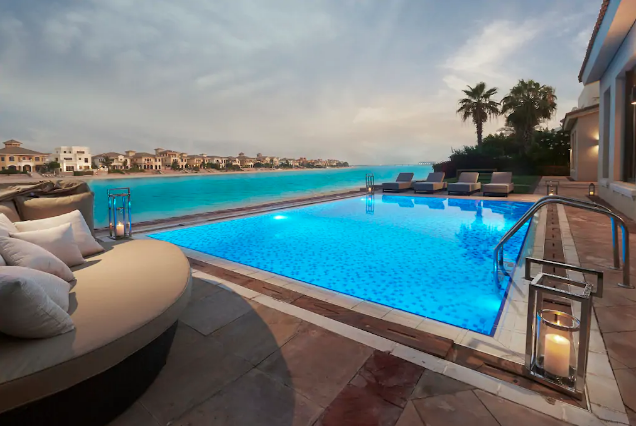 With 6 en suite bedrooms, a pool, and a private beach, their description boasts that they “have welcomed celebrities, CEO’s and Royals who desire the exclusivity and privacy not found at the nearby 5 star resorts” so if you stay there, you’re in good company! The interiors are pure elegance, and the entire experience screams opulence. More here. 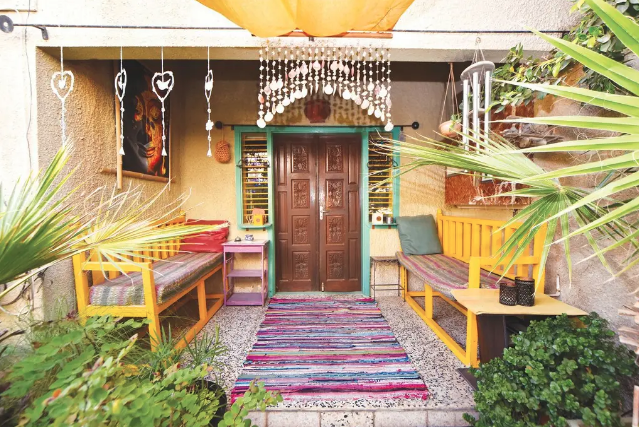 This 1950s house in the Bahraini capital is homey and whimsical, decorated by Superhost Emmanuel, a self-described “quirky French artist” in what becomes an unusual blend of bright, shabby-chic style and a somewhat colonial aesthetic. 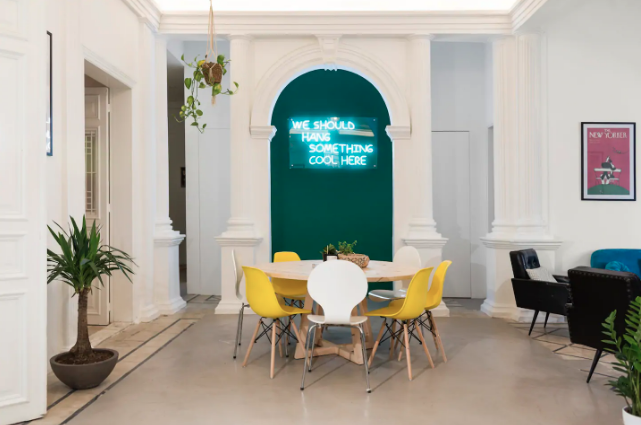 The cute space is a 5 minute drive from the city center, and not only is continental breakfast included for no charge, the host also provides complimentary SIM cards with data. More here. In a word, this space is exquisite. 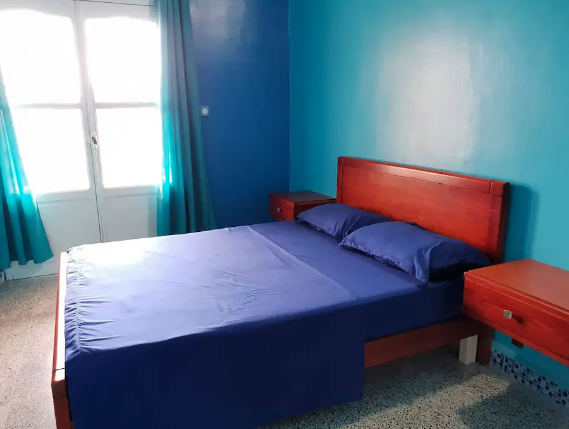 Located in a quiet neighbourhood a few minutes from the center of the Medina, the space is divided into 2 bedrooms, each of which is booked privately, and the guests of each room share the remainder of the home which includes a large living room, covered patio with dining area, a kitchen and a large terrace. 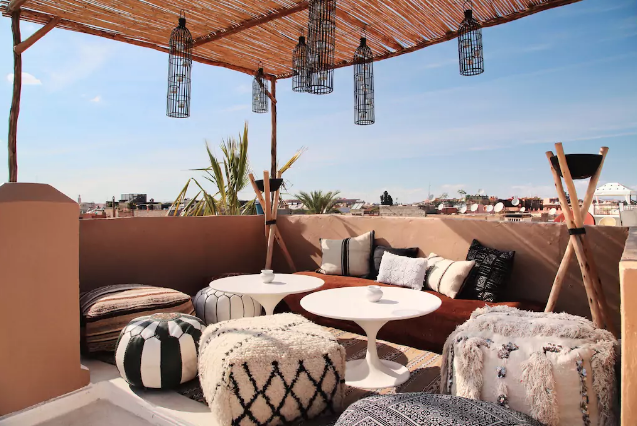 A stylish fusion of traditional Tunisian elements and funky vibes, the attention to detail in this stunning spot is unmatched and people have taken notice: the palace has been featured in various French and English interior design magazines. More here. If you’re talking going back to basics, the Residence Kenza, a series of rooms which are literally caves, is pretty much it. 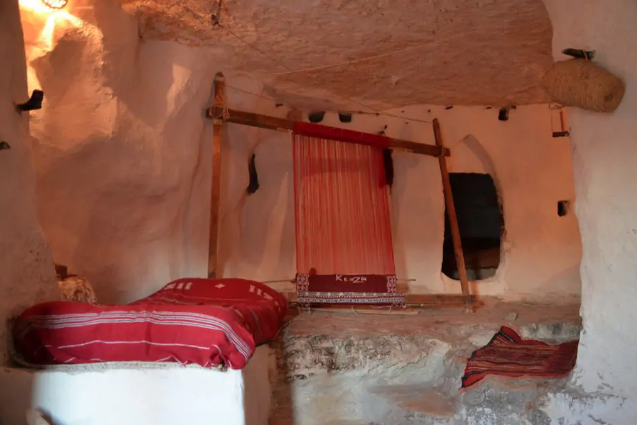 Located in the remote village of Chenini in the Tataouine district in southern Tunisia, the idea imitates the ‘cave dwellings’ of the native Berber population of the area. 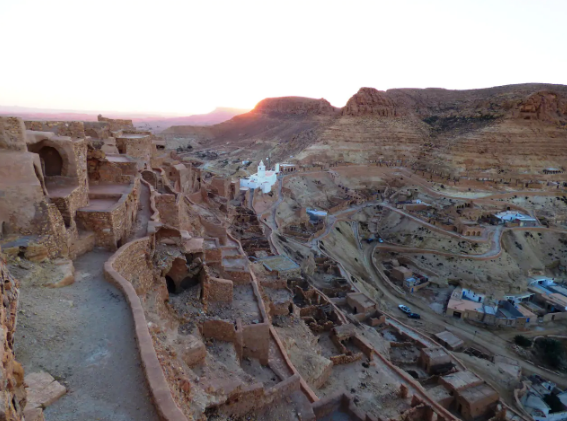 The city of Tataouine also happens to have inspired the fictional Star Wars planet of Tatooine – George Lucas actually filmed scenes in the original movie there. 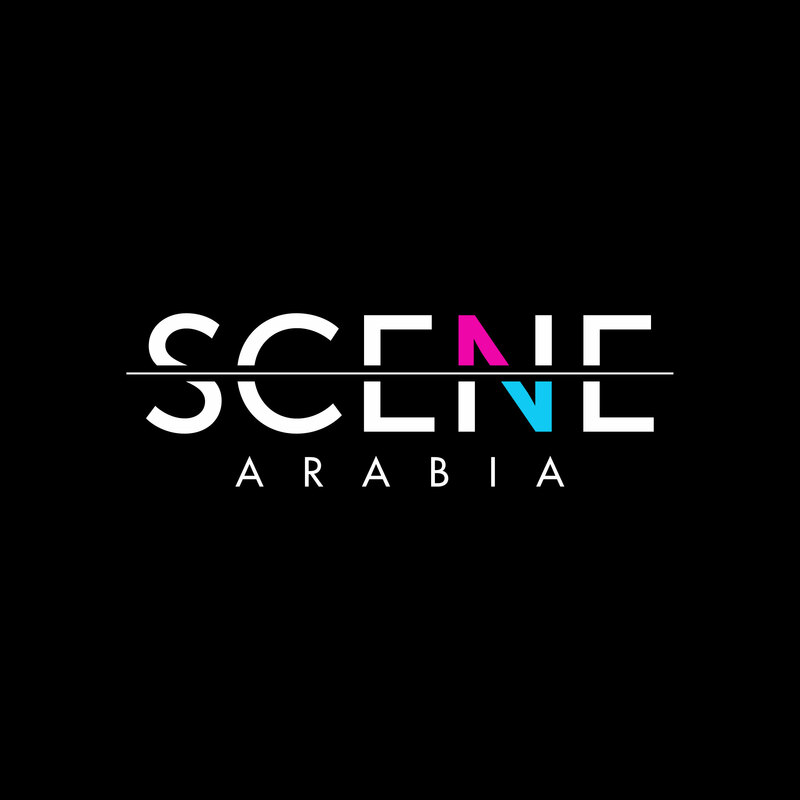 The project is a sustainable development which also works to preserve the cultural heritage of the region. 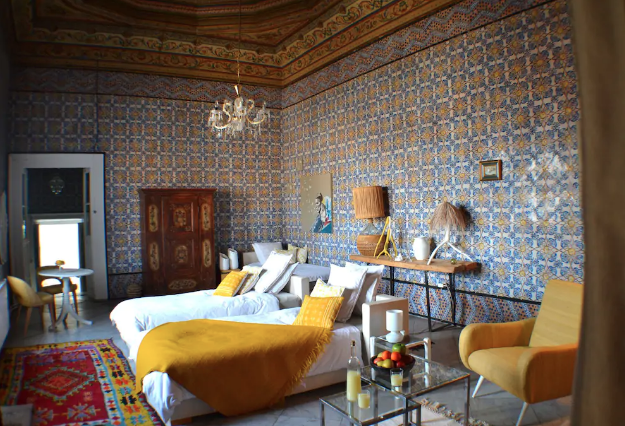 The rooms are raw and stripped down, reflecting the traditional homes they are emulating, and guests have raved about the sunrise and sunset views from the spot, as well as the complimentary Tunisian breakfasts. More here. Djerba, an island that lies off the coast of Tunisia, known for Mediterranean beaches and whitewashed desert towns influenced by Berber, Arab, Jewish and African cultures, is where this stay is located – in the small 50,000 person town of Midoun to be precise. 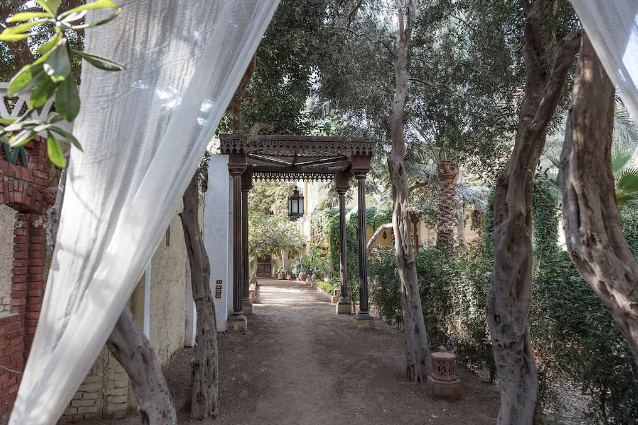 A serene oasis nestled among olive trees is pretty much where you would go for total tranquility. 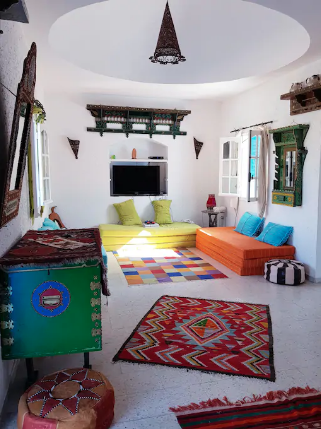 With three bedrooms and a pool, the entire space brings a colourful Tunisian aesthetic into the 21st century with beautiful bright hues everywhere and quirky authentic elements throughout. More here.